When I was little, I used to make pikelets on a regular basis - I would get up early Sunday morning and make a big batch for the family. I swore by the Women’s Weekly cookbook recipe, and by around 18 years old, I knew the recipe off by heart. Then one day, something happened and they turned out awful. I wasn’t sure what it was but the pikelets didn’t taste the same (sorry if this sounds like a children’s book). At that point I stopped making them fresh and used ‘shake-a-pancake’ style batter instead (these are actually quite good so I don’t discourage using them). I still to this day make pikelets for the family (when on holidays in Dunsborough) and every so often Sunday mornings for my other half, Colin. Flipping through Donna Hay’s Seasons, I came across Mini Hot Cakes with Cinnamon Butter. 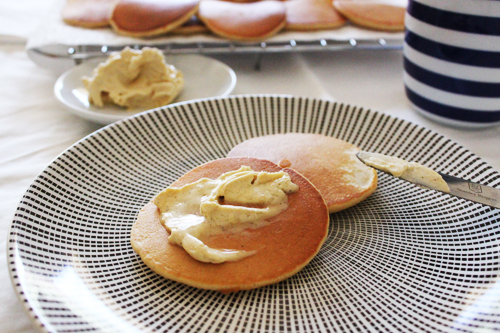 They looked so adorable, and memories of making pikelets from scratch came back. Game on. I was to make them once again. This recipe is very different from the Women’s Weekly one, but still great. They are fluffy and full of flavour, and the cinnamon butter works perfectly - I found I didn’t need to use any other condiments on them. If you don’t have the biggest sweet tooth, I recommend holding back on the honey in the butter. I didn't use buttermilk as I never see the point in buy 1 litre for a recipe that calls for 1 cup. So for this recipe I just used plain milk. Use a electric mixer to beat the butter, cinnamon and honey until light and creamy. Set aside in a cool place. In a bowl, combine the milk, egg yolks, lemon rind, vanilla, melted butter and honey and mix. Sift in the flour and baking podwer and combine well. In a separate bowl, beat the egg whites until soft peaks form. Gently fold into the batter. Heat a non-stick frying pan on a medium heat. Add some of the extra butter and when melted, spoon heaped tablespoons of the batter into the pan. Cook on each side for 2 minutes or until golden.